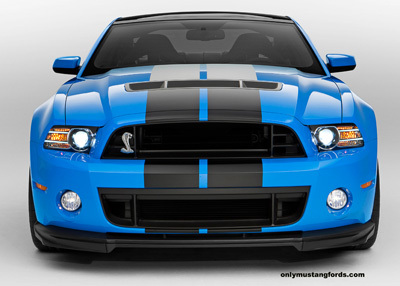 The 2013 Shelby Mustang GT500 - Would You Believe 650 horsepower? The new 2013 Shelby Mustang GT500, benefits from even more improvements from Shelby and the Ford SVT engineers, cranking engine output to an astonishing 662 horsepower! That with a top speed exceeding 200 mph, and Ford's usual conservative ratings, real world specs are probably even higher. Either way, boosting performance up by an additional 100 horsepower is going to make the 2013 Shelby Mustang GT500, an already stellar performer even more amazing. Well, there's no more need for spy photos, the snake is out of the bag. As you'll see in the accompanying 2013 Shelby Mustang GT500 pictures, changes in styling and exterior pieces seem to be more for function than as a result of any particular stylish change in direction. What has shown up on the car at the 2011 L.A. Auto show and in pictures, is changes in the front fascia and grille areas,designed primarily to increase air flow to the radiator and a new three bank, air-to-liquid intercooler. 2013 Mustang GT filled in on the right hand side with a Shelby Snake logo and the left hand side covered by slats which disguise the snake's remote oil cooler air ducting. Despite the appearance, however, Ford says that what little we see of the new Cobra front grilles is actually designed to create downforce. That means that incoming air is directed in such a way as to push the nose down as speed increases, theoretically making the front suspension hold the road better, improving handling. 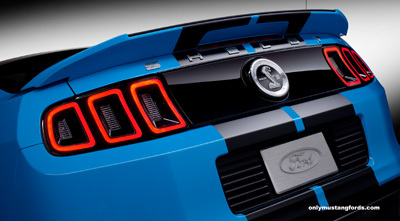 From a styling and visibility perspective, the 2013 Shelby Mustang GT500, like it's cousin, the regular 2013 ford Mustang, benefits from the new LED trimmed front headlight bezels and rear LED rope lights surrounding the twin sequential tail lights. but the rubber will be the same, very effective Goodyear Eagle F1 Supercar G:2 tires. With an already superb handling performance, you'd wonder what they could do, to improve it, save for the addition of an independent rear suspension. Even though it looks like no IRS is in the cards, the underpinnings still received some massaging and improvements, including an electronically adjustable Bilstein suspension damping system. Having owned and had to pay repairs on a car with one of those infinitely adjustable,constantly adjusted suspension systems, I'd like to think, that the Shelby GT 500's much simpler two setting, street or track valving settings will have the chance for a longer, less troublesome life. The stock Brembo brakes have been beefed up as well. The interior is essentially the same as the 2012 GT500, but includes the very cool features seen in the 2013 Boss 302, such as your very own accelerometer, drag strip training Christmas tree as part of the Track Apps package. And like the 2013 Mustang Boss, there's the very nice Ford SYNC system to grace the interior of your 2013 Shelby Mustang GT500. 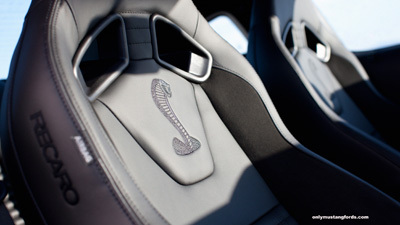 Carried over to the new 2013 Shelby Mustang GT500,from the 2013 Boss 302, are the supportive and necessary Recaro bucket seats, with the necessary Shelby Cobra Snake logo. 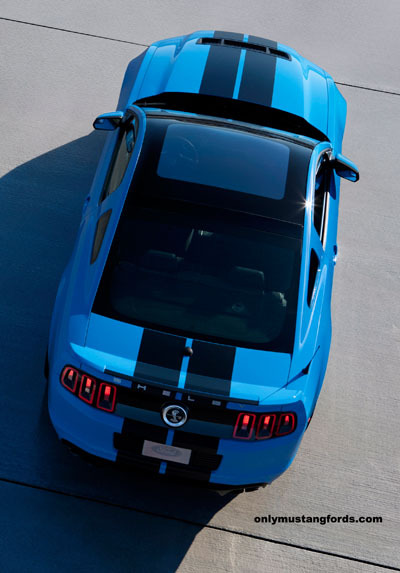 The biggest news for the 2013 Shelby Mustang GT500 is a substantial increase in power, coming from changes in two areas. First, Ford's engineers have bored out the all aluminum 5.4 liter engine, which made it's debut in 2011 to a full 5.8 liter V8. Apparently, this possibility was factored into the mix when the engine was developed, so the cubic inch increase achieved from boring out the cylinders, represented no issues with cooling, or water jacket penetration. The engine, like it's predecessor, makes use of Ford's strong and thin, plasma transfer wire arc cylinder wall coating to prolong longevity. Also, as used in the 5.0 liter Mustang Coyote engine, the cylinders receive the benefit of oil jets, which both lubricate and cool the pistons and rotating assembly, further improving their life under high power conditions. And that's probably a very good thing, as no doubt, many of these factory supercars will be raced and pushed right to their new, higher 7,000 rpm redline. 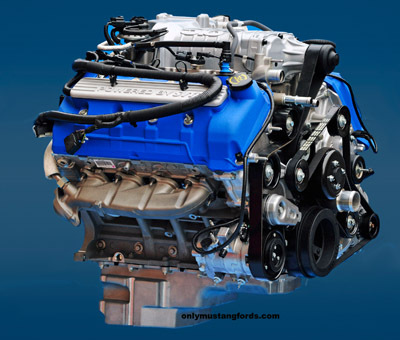 The second source of more power for the 2013 GT500 Mustang is the addition of a new, more efficient Eaton TVS supercharger, which I suspect is the same 2.3 liter blower that has been added to the 2013 Boss 302 . The combination of this technology and other incremental improvements and refinements results in the 5.8 liter engine cranking out a recently updated and of course, outstanding 662 horsepower and 631 lb-ft of torque through the beefy, externally cooled Tremec TR6060 transmission. Ford and Shelby engineers opted for a 2013 Mustang GT500 specific gear set, optimizing the 6 available speeds, in order to best use all that new power and hopefully, keep the new Shelby GT 500 away from the gas guzzler tax. Six hundred and fifty horsepower and decent fuel economy. Isn't technology amazing? The other changes to the drivetrain include a slightly beefier clutch and a change in the driveshaft, to a one piece carbon fiber unit. Not only is the rotating assembly marginally lighter and probably easier to balance, but there's one less part to break under heavy use. The 2013 Shelby Mustang GT500, with all of the changes and refinements is a car that is capable, in the right hands of reaching 200 mph. The caveat is, that like many European Supercars, without it's electronic speed limiter removed, it will be saddled with a self imposed top speed of 155 mph. And for those of you who live life - a quarter of a mile at a time, you'll be interested in checking one out at the drag strip. If the the new GT 500 specs live up to what's on paper, you could wind up seeing the likes of a stock 2013 GT500 Shelby Mustang, running mid to high 11 second times in the quarter mile. Kind of steals the Chevy Camaro ZL1's thunder. As crazy as it is, even with the output of the new Chevrolet's supercharged LSA V8, the 2013 Shelby Mustang surpasses the Camaro ZL1's output by 70 horsepower, making the new Chevy hot-rod only just biting the heels of the 2012 Shelby GT500's performance numbers. Mustang. With all that power, having a launch control similar to that used in the 2013 Boss 302, is not only a nice feature, it's a virtual necessity. It makes getting all that horsepower to the ground, a no brainer. Just set the 2 stage rev limiter for the right off the line RPM, mash the loud pedal to the floor and when the light turns green, drop the clutch. The electronics take care of the rest, adjusting the redline back to it's new 7,000 rpm limit, ready for the next shift. Who says there's no royalty in North America? 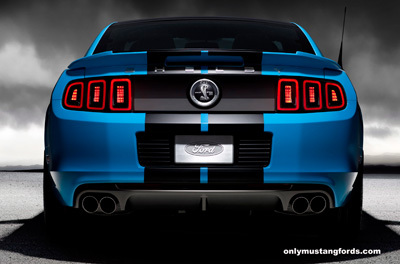 The new 650 horsepower Shelby engine for the 2013 model year has been certified to be the most powerful V8 engine in the world. 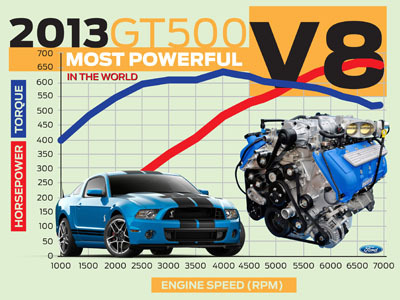 Now that top end number is impressive, but as you see from the cool graphic below courtesy of Ford Motor Company, that this huge output in the 2013 Shelby Mustang GT500 is generated at a relatively low 4,000 rpm, the even more interesting thing, is to look at a few of the other "seat of the pants" levels and the what you could be looking at full on racing at redline. Can you imagine the feeling you get mashing the throttle from idle, when it's already producing 400 plus pounds of torque? Or knowing that at it's 7,000 rpm redline this power plant continues to pump out over 500 lbs of twisting force! I just can't get the visual out of my mind, thinking about how wild this motor would be, stuffed into the engine bay of a 1970 fastback. Woo Hoo! 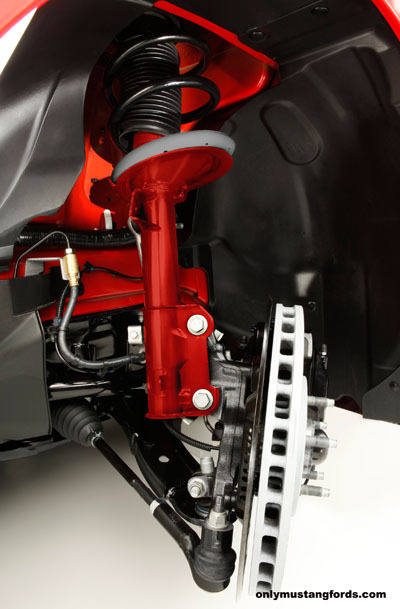 New for the 2013 Shelby Mustang GT500, is a helical gear "Torsen" (torque sensing) differential with larger bearings, which adjusts torque distribution between the left and right side rear axles ensuring the most available power gets to the ground, even under grueling conditions. This differential, usually referred to as a Type A, or Torsen T-1, is based on the original Torsen design and uses crossed axis helical cut gears to provide higher torque bias ratios than other types, including the 2012 GT 500 's system. The downside to these differentials, is the need to set them up properly, or face the consequences of noise, vibration and harshness issues, which these days, is of utmost importance. To ensure performance and long life, Ford added a temperature activated electric pump to cycle cool fluids through the 3.31:1 ratio rear end. 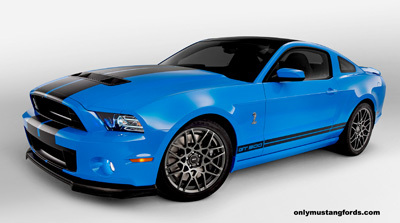 Can't wait till the 2013 Shelby Mustang GT500 order guide is available. Better yet, a test race... Ummm, I mean test drive. Not only is the new GT500 a fitting tribute to the late Carol Shelby, it's probably the best overall package ever to leave the Ford proving grounds. Check out the new video of the Shelby Mustang GT500 at Road Atlanta above, which moves from a walk around to an assault on the course and for driving impressions, follow the link to our 2013 GT500 first drive. Here's an interesting fact. The car with the most powerful V8 in the world is gas guzzler tax exempt! Yep. Who would have thought that a 600 plus horsepower supercar like the GT500 would be pulling 15 mpg city and 24 mpg fuel economy in highway cruising? Comparing gas mileage to it's competitor, the Chevy Camaro, the snake wins by a tidy 5 mpg margin.